Over a quarter (27%) of charity donors are preparing to leave a charitable legacy or have already done so (up from 23% in March 2009), according to the latest consumer tracking figures from Remember A Charity. 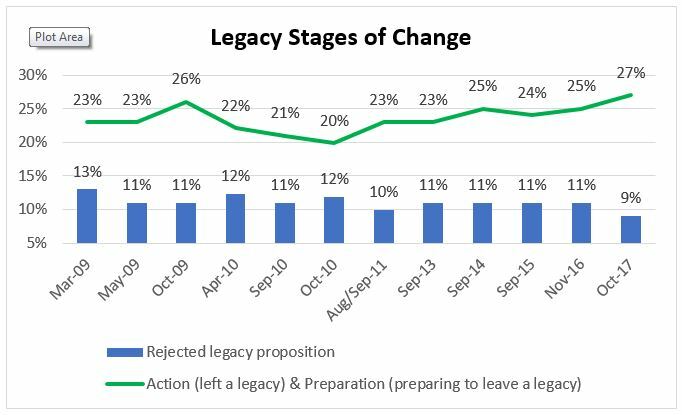 Only 9% reject the prospect of making a legacy donation, down from 13% when the consortium’s tracking study began in 2009. The research also indicates that awareness of legacies is growing, with just 12% of those surveyed saying they are unaware of the option of donating to charity through their Will (down from 17% in 2009). “Legacy behaviour and attitudes are really starting to change. While we are likely to see some fluctuation year-on-year, now with nine years of comparable data, we can see a sustained shift in public attitudes towards legacies. This echoes findings from Legacy Foresight and Smee and Ford, showing longer-term growth in the number of gifts in wills and charities benefitting, as well as the amount given. The research, carried out by nfpSynergy, looks at the attitude and awareness to legacy giving among 1,000 UK charity donors aged 40+ on a scale ranging from rejection to action. One in six (16%) of the over-40s questioned in 2017 say they have written a charity into their will (the second highest figure on record behind its peak of 17% in 2015) and 11% say they are preparing to do so (up from 7% in 2015 and 9% in 2016). A further 13% say they are contemplating it. Six stages of change for legacy giving: active rejection, pre-contemplation (unaware), pre-contemplation (aware), contemplation, preparation and action.